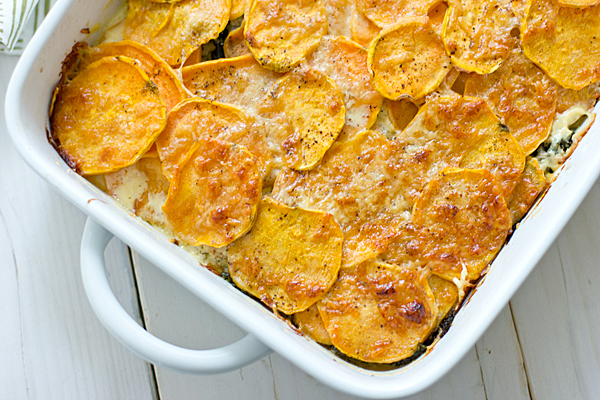 A boost of beta-carotene and Vitamin C makes this comforting casserole a keeper for cool autumn evenings. Demoed by Danielle at Brookside Gardens and USBG in September 2014. Preheat the oven to 350̊F. In a medium skillet, heat the oil over medium heat. Add leeks and cook, stirring occasionally, until they begin to brown, about 8-10 minutes. Add the sherry or broth to deglaze, add the chopped sage and cook until liquid has reduced by half, about 3 minutes. Set aside. In a 2-quart shallow baking dish, arrange the apples in one layer. Spread the leeks evenly over the apples. Arrange the squash in one layer over the leeks. Evenly pour the remaining broth (or light cream) over the squash, sprinkle with cheese. Cover tightly with foil and bake 45 minutes, but check it after 30 minutes for doneness. When cooked, the tip of a pairing knife should easily pierce the gratin. Remove foil and bake another 5-10 minutes, until cheese is golden. Let cool 10 minutes before serving. Garnish with additional sage leaves, if desired. Serves 6. This entry was posted in Sides, Vegetarian and tagged apples, butternut, leeks. Bookmark the permalink.